Last November I attended the Stampin' Up! twice yearly corporate event called On Stage. It really is such a fun day and one of the highlights is seeing the new catalogue that is due out - we get to see it a couple of months before everyone else and I love that. I always want to be first in the queue! 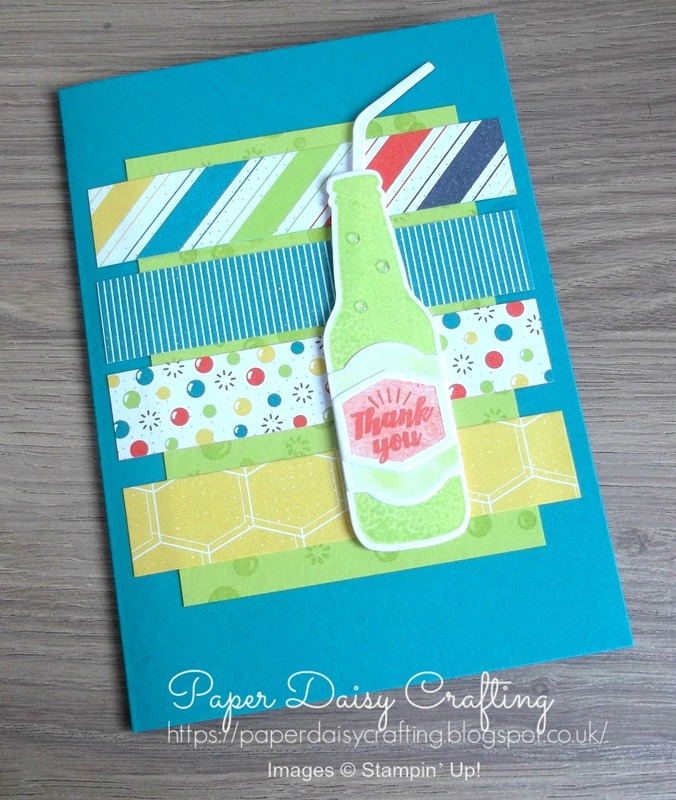 The card also uses some patterned papers which are FREE as one of the Sale-a-bration offerings. Spend £45 and you can choose them as your FREE item. They are so bright and colourful - I love them! Oh and one last thing. Did you notice the little drops of condensation on the bottle? Those are from a pack of clear and glitter epoxy shapes - cute eh? Hope you like today's project. Only one more day to use my February shopping code. I'll be closing that off tomorrow and sending out a little package of freebies to anyone who has shopped with me over the past month.